To improve your ability to think creatively, try one of these changes to your work routine. Every seven years, designer Stefan Sagmeister (TED Talk: The power of time off) closes his New York design studio for a year-long sabbatical. During each sabbatical, he pursues “little experiments, things that are always difficult to accomplish during the regular working year.” The effect on Sagmeister’s studio has been profound. “Basically everything we’ve done in the seven years following the first sabbatical came out of the thinking of that one single year,” he says. Don’t think you can take a year-long sabbatical? Below, 6 easier ways to recharge the creative spirit. Willa Cather wrote for three hours a day. “I don’t hold myself to longer hours; if I did, I wouldn’t gain by it,” Cather once said. You might need to put in 8 hours a day at the office (who doesn’t? ), but it helps to think about your workday in smaller chunks like this, and set break points throughout the day. Watch this TED Talks playlist for more ideas around work. Creative minds need to refuel to stay sharp. Need some fresh inspiration today? Watch this playlist of TED Talks to kickstart your creativity, or read this excerpt from Pico Iyer’s new TED Book, The Art of Stillness. Novelist Henry Miller wrote until noon, then spent the afternoon recuperating and rejuvenating. Miller’s justification, notes Mason Currey in Daily Rituals: “I don’t believe in draining the reservoir, do you see? 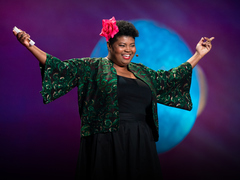 I believe in getting up from the typewriter, away from it, while I still have things to say.” Watch this playlist of TED Talks by authors. Like many authors, Daniel Gilbert wrote much of Stumbling on Happiness while on leave from his “real” job as a professor. Watch Gilbert’s 2014 TED Talk: The psychology of your future self. Don’t think you can take time off? It may be easier than you think. For inspiration, read app developer Winston Chen’s TED Blog post about his mid-career sabbatical. He was inspired to move across the world with his family after watching Stefan Sagmeister’s talk, The power of time off. Featured image via Death to the Stock Photo.